Thanks to manufacturers getting wiser about bypass systems in general, and which terms to use (and not use) in their marketing, it’s been years since I had anything new to write about on the ”hall of shame” page. So I decided to retire it. Since it is such a rare occurrence these days that I actually come across any foul play (unintended or not) in this regard, I’ve decided to give each discovery its own post. So here’s the first one, concerning a pedal from Dunlop/MXR. MXR pedals and Crybaby wahs traditionally used the ”hardwire” bypass style, where the signal was simply split at the input jack – one wire leading to the circuit input, and another straight to the switch (for the bypass signal). The term ”hardwire” wasn’t used at the time – that was coined later, when Dunlop had taken over the MXR brand. In the early 00’s, Dunlop/MXR slowly started using ”true hardwire bypass” to denote pedals that are actually true bypass (not just ”hardwire”). They use a variant on the Millennium circuit to control the LED, so they could keep using DPDT switches. The older circuits still in production have stayed ”hardwire” until they were due for a redesign for other reasons. If you google ”dunlop bypass guide”, you should find a spreadsheet detailing all of the Dunlop/MXR pedals and their bypass arrangements. In one of those documents, they even posted info on older revision 535Q’s, which were wired for true bypass, but had a couple of misplaced resistors (R41 and R42, if you want to check yours) which effectively made them ”hardwire”. So, what about the DB-02? 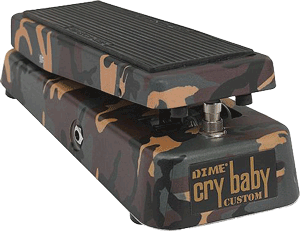 The DB-02 – also known as ”Dime Crybaby Custom” – is the simpler of the two Dimebag Darrel signature wah pedals (the one without the external switches and mini pots), and it is largely based on the GCB-95F Crybaby Classic circuit board. Like the Classic, it is being advertised as ”true hardwire” bypass. And as with the Classic, the wiring checks out – it uses a DPDT switch wired for true bypass. A while back, I had one of these on my bench for a simple LED mod, which in this case meant I had to install a 3PDT in place of the original DPDT. I wired it up as normal, using the wiring style that shorts the circuit input to ground in bypass mode (as described here). Weirdly, the active mode was fine, but there was no sound in bypass mode. Hmm. 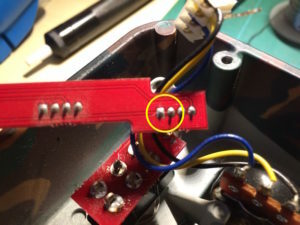 Now, if you’ve read the wah mod FAQ, you know that means there’s still a fixed (hardwired) connection between the input jack and circuit input (so the switch doesn’t only short the circuit input to ground, but also the main input and bypass line). But the DB-02 is supposed to be true bypass from the factory, so how can that be? After a bit of searching, I found the culprit – up by the wire connections that lead to/from the switch, there was a tiny circuit trace between the main input connection and the circuit input (circled in the image – click for full size). 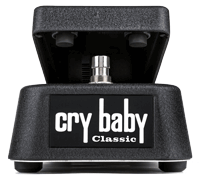 This obviously defeats the true bypass, making the pedal ”hardwire” just like the regular GCB-95. I quickly cut that trace, and the bypass signal came back, indicating that the pedal was now true bypass for real. Now, the scary part about this is that since the DB-02 uses the GCB-95F Crybaby Classic circuit board, this could potentially affect that pedal as well (along with any other pedal that is based off of it). The signature wahs will sometimes have small tweaks to the circuit (and sometimes it’s just the shell that looks different), but the switch connections aren’t likely to change. If you have a Classic or DB-02 (or any other Classic-derived wah), you can quite easily check if yours is proper true bypass or not. You can either take the circuit board out and simply look if the trace is there, or use a multimeter to measure between wires 1 (counting from the bottom of the 4) and 2. The bypass switch should affect the reading – in active mode, you should see continuity/zero resistance, while in bypass mode there should be infinite resistance/open circuit. If there’s continuity in both modes, the pedal has the trace and isn’t proper true bypass. If you do take a look at yours, let me know the result and what revision it is (marked somewhere around the lower end of the board). It’d be a good public service if we could pinpoint which pedals/revisions are affected and which are not. My e-mail is in the footer.